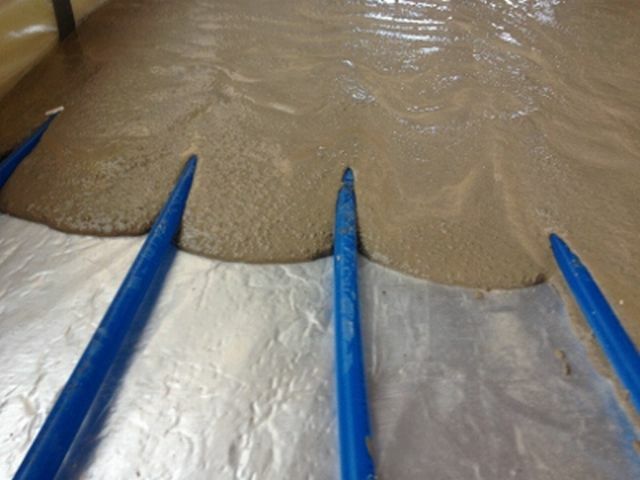 Südanit 280 Alpha Hemihydrate Screed is a pumpable, high-quality screed material based on calcium sulfate. It is supplied using a pre-blended compound and is mixed on site with a special blend of approved aggregates to EN 13813: 2002. It is designed for application at thicknesses of 20–90 mm. Südanit 280 Alpha Hemi Hydrate Binder complies with EN 13454-1: 2004 and is CE marked. Underfloor heating – full encapsulation. Suitable for underlayment in wet areas. BS EN 13454-1/ EN 13813: 2002. CASEA Sudanit 280 Alpha Hemihydrate Screed is suitable for floors in homes, offices, public buildings and places exposed to similar loads. It may be applied as a levelling screed directly onto a load bearing floor, unbonded on a separating barrier (polythene) or as a floating floor and is particularly suited in conjunction with underfloor heating or cavity floors. It should be covered with a floor finish such as tiles, linoleum, parquet, cork or carpet. If a cement based adhesive or smoothing compound is required, the surface of the screed must first be sealed, using an appropriate acrylic primer/ sealer. Minimum thickness: Bonded, 20 mm. Unbonded, 30 mm. Domestic, 35 mm. Commercial, 40 mm. Over underfloor heating pipes: 25 mm (BS 8204-7). Tensile adhesion: > 1.5 N/mm². Shrinkage (28 days): < 0.1%. Hardening time (before foot traffic): 8–12 hours. Reaction to fire: A1 non-combustible. Wet Density: Ca. 2,088 kg/m3 (2.1 kg/mm/m2). The product information below is from the NBS Plus library of product clauses offered in NBS specification products. It has been created by NBS for SMET Building Products Ltd. Each product clause is authored in NBS format and is intended for inclusion in project specifications. Please note that NBS product guidance is not a replacement for the manufacturer's literature and it is recommended that SMET Building Products Ltd be consulted before specifying.